I love the whole sub-genre of Spaghetti Westerns. They were made by Italians and filmed in Spain, because the landscape resembles that of the old west. Italian directors at that time had a great eye for scenery, atmosphere, and excellent camera work. They also had a great ear for music and incidental background noises that really set the atmosphere. The morals to these stories are always gray, as the heroes are not exactly the best people in the world, and a lot of the times you find yourself seriously questioning their actions. There are many great Spaghetti Westerns out there, but the most definitive and well made of them all is Sergio Leone's "The Good, The Bad, And The Ugly" (1967). "The Good, The Bad, And The Ugly" is the final part of a loosely knitted together trilogy. The first two installments were "A Fistful of Dollars" and "For a Few Dollars More". The movies center around three characters, Tuco, Angel Eyes, and Blondie(or The Man with No Name), whose paths cross in some way or another in all three films. All three of the men are scum, especially Tuco who is a sloth and a violent thief and drunkard. Angel Eyes (played by Lee Van Cleef) and Blondie (played by Clint Eastwood) are no better. They are bounty hunters, thieves, and guns for hire as well, but they have a certain air of sophistication about them that Tuco lacks. "The Good, The Bad, And The Ugly" pits these three characters against each other perfectly. The movie opens with Tuco and Blondie in the midst of an ingenious money making scam. Tuco has a price on his head just about everywhere. As the two travel from town to town, Blondie pretends he has captured Tuco and hands him over tho the authorities to collect the reward money. As Tuco is about to be hung for his crimes, Blondie shoots the rope, and the two get away to go to the next town, where Tuco's bounty has now gone up. Eventually, the two hear of some money that is buried in a soldiers grave. The problem is, one knows only the name of the cemetery and the other knows only the name on the grave. Eventually, Angel Eyes enters the picture, and the three men try to no end to outsmart, back stab, and betray each other to find out where the money is. Eventually some one gets the money. But who? And which one is the good, which one is the bad, and which one is the ugly? A tough decision, but that is only one thing that makes this movie so great. Of course one of the best and most memorable things about this movie is the excellent, beautiful, and strange soundtrack by Ennio Morricone. Mixing fuzzed out electric guitar, whistling, chanting, and Spanish horns, fused all into a Western movie soundtrack. His music is instantly recognizable and unforgettable. One word of note: only watch this movie in wide screen. 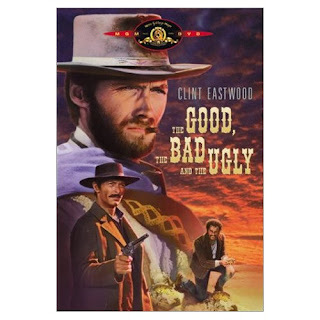 If you have only seen this movie in pan and scan, as they usually show it on TV, then you have not really SEEN "The Good, The Bad, and The Ugly". I first saw it in the full screen TV format, and a few years later I broke down and bought it on DVD in wide screen. It was like watching a completely different movie. Visually, it floored me. Anyway, if you haven't seen this one, drop what you are doing and go rent it now.